Here is an interesting photograph. 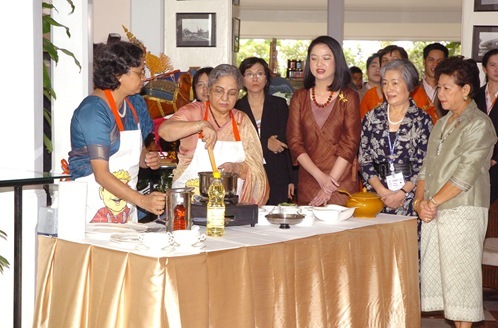 A cooking demonstration by the wife of the Prime Minister, Dr. Manmohan Singh, Smt. Gursharan Kaur. The demonstration was given at Mrigadayavan Palace Sofitel Centara Grand, in Thailand, on October 24, 2009. To view the big picture, log on to Press Information Bureau.